Regenerative Medicine1 is the science of replacing damaged, diseased tissue or organ with a healthy cell using advanced tools, such as cellular therapies, tissue engineering, and gene therapies. Globally, there is a paradigm shift from chemical drugs to a large-scale adoption of biologic therapies. These biologic therapies are emerging as an alternative solution to some of the previously untreated health issues, such as late-stage cancer, juvenile diabetes, and heart failure. Up until the early 2000s, the market was dominated by chemical drugs, such as chemotherapeutic agents for cancer, biguanides for diabetes, and many more that were manufactured in bulk volumes, catering to the needs of large populations at a go. The market players traditionally followed the bulk manufacturing pattern for these drugs, which suited the market demands. However, with the changing times, and advancements in the field of biotechnology, applied sciences replaced the traditional drug development patterns giving rise to novel biologic drugs. While technological advancements have made the daily lives of human beings easier with improved spending capacities, it has unknowingly given rise to a major issue of sedentary lifestyles with minimal physical exercise. These have in turn led to a rise in lifestyle-related disorders. Conditions such as diabetes, hypertension, and high cholesterol, which were earlier, associated with age, are now found in most the middle-aged population. As per the World Health Organization, diabetes is one of the leading lifestyle disorders in the modern world with 422 million2 cases in 2014 and hypertension surpassing diabetes with more than a billion3 cases worldwide. On the other hand, a surging geriatric population that is set to reach 1 billion4 in the next 10 to 15 years is worsened by growing cancer cases amounting to 15 million5 by 2020. In this situation, the available chemical drugs are not fulfilling the changing therapeutic demands. Especially in case of cancer, in which cases of relapse are primarily treated with chemotherapy, there is an ardent requirement of cutting-edge therapies that not just treat the symptoms but cure it. This growing need has given rise to advancements in biologics and in turn regenerative medicine. Cellular and gene therapies and tissue engineering are the major segments constituting the entire regenerative medicine arena. Successful studies and clinical trials are generating new hopes in the form of cutting-edge cell and gene therapies. More so, these are the ones making the news. Globally, cell therapy is witnessing a surge in R&D activities with tremendous efforts from small- to mid-segment companies with targeted therapeutic focus. Whilst the market is loaded with dermatological (especially anti-aging) and musculoskeletal therapies, the approval of Kymriah by Novartis and Yescarta by Gilead have indeed brought in a fresh lease of life for previously unresolved cancer cases. In August 2018, Novartis received marketing authorization for Kymriah from the European Commission becoming the first and only company with an approved CAR-T cell therapy for two distinct indications in the United States and the European Union. Following Novartis’ and Gilead’s footsteps, BlueBird Bio6, in July 2018, received an accelerated assessment by the Committee for Medicinal Products for Human Use (CHMP) and the European Medicines Agency (EMA) for their cutting-edge gene therapy LentiGlobinTM, a severe sickle cell disease therapy, further strengthening the case for life-saving therapies. Likewise, companies, such as Juno Therapeutics, Celgene, and Tigenix, are moving in the same direction with either their in-house pipeline of novel cell therapies or through the acquisition of niche players. For instance, in June 2018, Celgene acquired Juno for a whopping $9 billion, gaining access to Juno’s upcoming CAR-T cell therapy. This was following the $11.9-billion acquisition of Kite Pharma by Gilead, gaining access to their now marketed CART cell therapy Yescarta. THE FUTURE – WHAT TO EXPECT? The very purpose of these huge acquisitions is to support the development of novel therapies not just across oncology, but also in other areas, including neurology, cardiology, and musculoskeletal therapies. Renova Therapeutics, Mesoblast, Japan Regenerative Medicine, and Viacyte Inc., are amongst the key players focusing on cardiovascular and metabolic therapies. Viacyte’s lead product PEC-DirectTM is a stem cell therapy based on pancreatic progenitor cells for type 1 diabetes. Most of these small- to mid-segment players focus on specific therapy areas and develop novel cell and gene therapies either on their own through private funding or in collaboration with bigger firms. 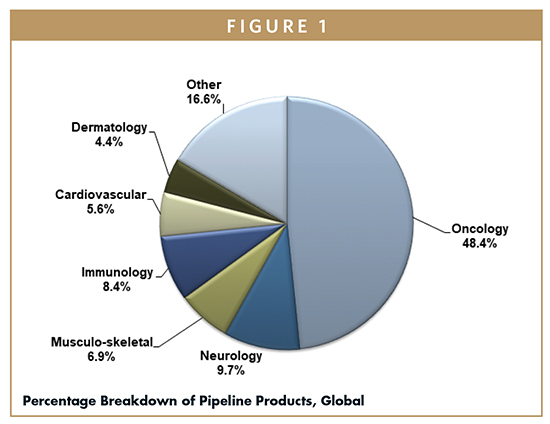 As highlighted in Figure 1, although oncology7 has been leading the charts in terms of R&D activities, significant investments have been made in neurology, musculoskeletal diseases, and immunology. Histogenics, a US-based cell therapy player is developing NeoCart®, a fortified 3D scaffold designed to accelerate healing and reducing pain in patients receiving treatment with functional cartilage. 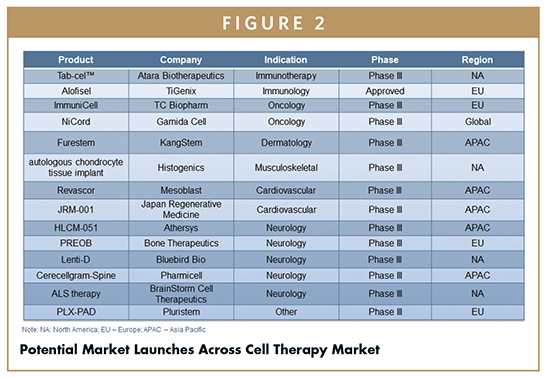 Furthermore, in terms of geographic spread, the Figure 2 suggests that, alongside North America7, APAC is emerging as a key region supporting cell therapy research with several local companies such as Mesoblast, Pharmicell, and Kangstem Biotech, having potential product launches in the next five to seven years. Acquisition: Bigger pharma players acquiring small- to mid-segment players with an aim of gaining technology and therapeutic expertise. In May 2018, Novartis invested a total sum of $8.7 billion for the acquisition of Avexis gaining access to the latter’s cutting-edge gene therapy for spinal muscular atrophy. Co-Development: This type of partnership acts as a risk-sharing model, by dividing the cost of development as well as the associated risks in case of product failure. Celgene collaborated with BlueBird Bio for the co-development and commercialization of BlueBird Bio’s CAR-T cell therapy bb2121. Outsourcing: This is the most convenient way of achieving drug development and manufacturing milestones. Outsourcing reduces the cost of development manifolds as well as reduces the crucial time to market especially in the case of T-Cell Therapies and CART Cell therapies’ manufacturing, which is highly time sensitive. Zelluna collaborated with MasTherCell in March 2018 for the development for the development of their TCR therapy. Cynata Therapeutics has been applying its proprietary Cymerus Technology8 for the development of MSC based therapies. In June 2018, Evotec announced the achievement of the second milestone in the development of iPSC based stem cell therapy for diabetes in collaboration with Sanofi. Together, the companies are at the forefront of their research for the development of beta cell replacement therapy based on beta cells derived from human iPS cells. While the cutting-edge CAR-T cell therapies are transforming the very treatment landscape, skyrocketing prices and non-availability of reimbursement are having large-scale implications for the very adoption of these therapies. Especially for Novartis’ Kymriah, which has been developed for a niche population, a price tag of $475,000 is turning out to be a major limiting factor. Globally, there are only 6,000 new cases of ALL, for which it is indicated. Of these, only 10% to 15% of the cases show a relapse, which is ideally the target population for Kymriah. To add to its woes, the cost of therapy is exclusive of hospitalization charges, which can go up to about $79,000, further imposing cost burdens on the payers. The result, first quarter revenues were four times9 lower than the anticipated values. Still, Gilead’s Yescarta is priced lower than Kymriah at $373,000, and also targets a larger population of Non-Hodgkins’ Lymphoma. As compared to Kymriah, the product has been successful in achieving its revenue targets with Q1 revenues of $40 million and Q2 amounting to $68 million10. However, despite being priced lower than Kymriah, the product has been facing reimbursement challenges causing lower-than-estimated product uptake. Cell Therapy is a niche market and is in a nascent stage with ongoing R&D activities on a global scale. While the market has been following the traditional one-time payment model, the high cost of these specialized therapies makes it redundant, paving way for more innovative models. The Centers for Medicare and Medicaid (CMS) is playing a pivotal role in devising a suitable payment solution for patients as well as payers. The agency initially had announced a value-based payment arrangement with Novartis, which relied on assessing the treatment outcome of Kymriah, 1-month post administration. Nonetheless, citing data collection challenges, this arrangement did not fend well and in early 2018, CMS made an exit. Regardless, this was not a lost opportunity, as CMS along with Gilead came up with an out-patient-based payment model, which essentially is an extension of the value-based model. 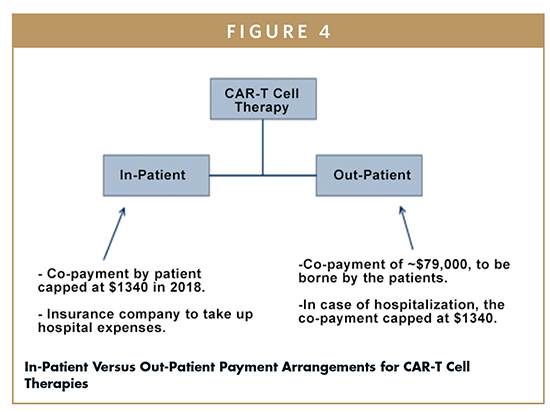 According to this arrangement, any CAR-T Therapy administered on an out-patient basis will be reimbursed11 at 6% above the wholesale acquisition cost, as per CMS guidelines. An out-patient arrangement will enable Medicare to reimburse the providers at a net price (post inclusion of discounts and rebates) with an additional 6%. Similarly, for new drugs, such as Kymriah and Yescarta, the agency will pay the manufacturer’s wholesale acquisition cost with an additional 6% amount for the first three quarters. This new arrangement entitles the agency to pay $500,839 and $395,380 for Kymriah and Yescarta treatment, respectively, when administered in an out-patient department (OPD) set-up. Additionally, the agency has clearly set the co-payment for Yescarta specifically at $79,076, while capping12 the patient costs at an annual in-patient hospital deductible amount of $1,340 in 2018. Experts suggest that this arrangement is the first step toward being paid for the CAR-T Cell therapies, by increasing the uptake across its key markets. The US accounts for almost 40% of the global cell therapy clinical trials. With the growing focus on stem cell and CAR-T cell therapies, the US FDA has been upfront in providing fast-track approval designations to most of the life-saving medicines. In August 2018, the FDA granted fast-track designation to Sellas Life Sciences’ cancer vaccine Galinpepimut-S.
As we move toward a better future of curative therapies, several other regional governments are contributing their share by providing conditional approval facilities for these life-saving medicines. Japan’s inclusion of the Pharmaceuticals and Medical Devices Act (PMD) and Safety of Regenerative Medicines Act (SRMA)13 in 2014, is set to transform the Japanese market paradigm by providing conditional approval for Phase III molecules in case of such life-saving therapies. As the therapeutic landscape evolves and transitions toward personalized and value-based care, regenerative medicine will play an increasingly important role. Moreover, the success of these therapies offers promising opportunities for previously untreated diseases areas. Hence, Regenerative medicine truly holds the potential to be the ultimate medical panacea. 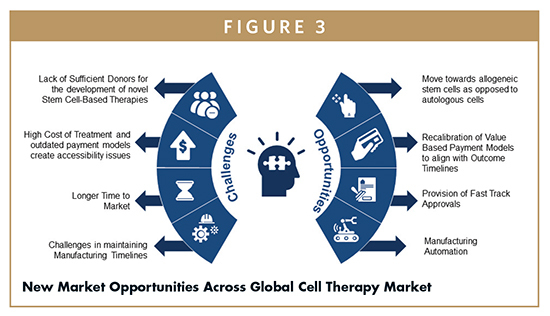 Frost & Sullivan Report – Growth Opportunities in the Global Cell Therapy Market, Forecast to 2022. Institutional Framework for Promoting the Future Implementation of Regenerative Medicine – https://www.mhlw.go.jp/english/policy/healthmedical/medicalcare/dl/150407-01.pdf. Aarti Chitale, a Senior Research Analyst at Frost & Sullivan, has 8 years of experience in market research. Her areas of expertise include regenerative medicine, with a keen focus on tracking market and technology trends in cell therapy. In addition to authoring numerous reports in the area of Regenerative Medicine, she has been tracking game-changing companies in this field by identifying some of the disruptive business models such as risk-sharing models, co-development, and fast-to-market models. 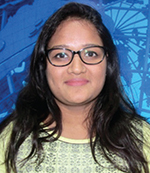 She earned her MBA in Marketing and International Business from Balaji University, Pune, and her Bachelor’s degree in Biotechnology from Osmania University, Hyderabad.